The first fight got the evening off to an entertaining start with both fighters getting plenty of kicks in. At first the fighters seemed quite evenly matched, neither of them taking too many risks, as each one assessed their opponent. In the second round the fight got much more aggressive. At one point it looked like Adam Butress had won but John Kerwin got back to his feet and both of them continued for the full 3 rounds. 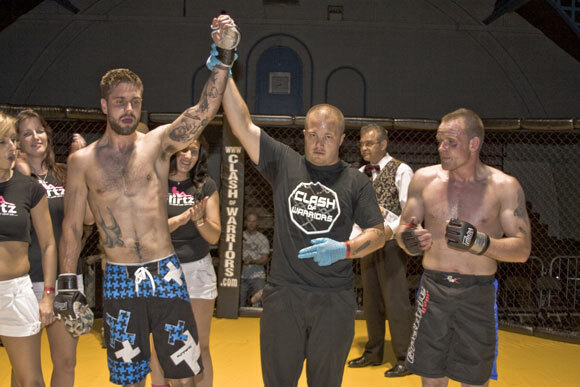 Adam Butress was announced as the winner by the judges unanimous decision. The second fight of the night was a much shorter affair with Darius Verbickus quickly displaying a dominance in the cage. Wesley Holmes almost lost his footing in the first round and looked like he suffered an injury to his leg after a well placed kick. Wesley tried to continue after the first round but simply could not. Danny Roberts quickly got off to an aggressive start with the ref having to hold him back at one point after a series of aggressive hits. It looked like it was over for a second but Luke Brown, spurned on by thunderous cheers from the crowd, stood up and got right back into the fight. Throughout the first round, both fighters had the other pinned down at one stage but it was luke brown who was getting in the punches which mattered. Towards the end of the first round Danny Roberts corner conceded defeat and Luke Brown was announced the winner. Both fighters were local boys and had plenty of support from the audience. 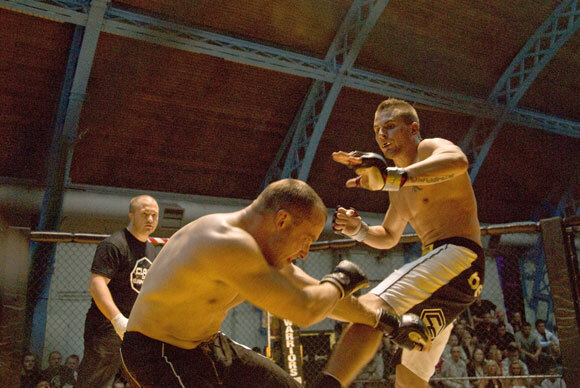 Chris McGragh stepped in at the last minute after another fighter dropped out. The fight got off to a good start with both fighters landing plenty of punches. However most of the first round was spent on the floor as both fighters were pinned down and the ref had to tell them to "keep busy". Andy Crichton got off to a much better start in the second round delivering a barrage of punches. 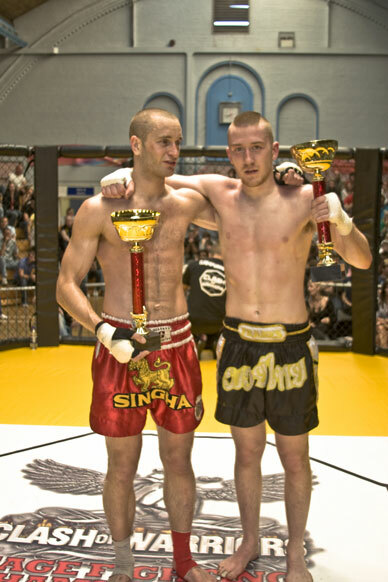 Although Chris McGragh managed to get him pinned down at one point, Andy recovered and went on to win when Chris McGragh tapped out in the 2nd round. Early on in the first round it looked like Wesley Holmes had lost his footing however he was quick to recover from the error. There was not a great deal of action to be seen in the first round with both fighters keeping each other at bay and neither managing to deliver the "killer blow." Spurned on by the crowd, both fighters stepped it up a gear in the second round. 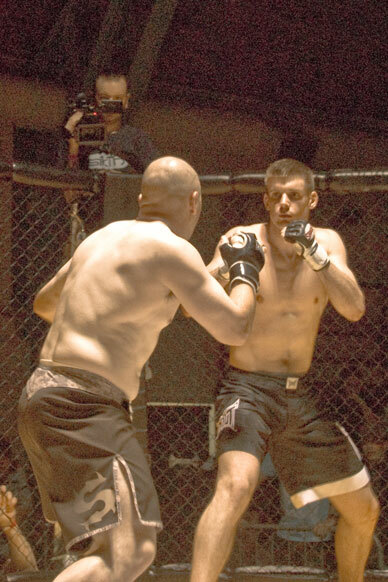 Although Wesley Holmes got in a number of good blows, the judges decision was unanimous and Benjamin Dennis was declared the winner. A much more explosive fight than the previous one, Phil Wimbleton got into position to spin round his opponent and dropped him to the ground. He repeated this move twice more in the first round making him appear to be the more dominant fighter. However Karl put up an amazing fight and despite suffering a broken shoulder and torn ligaments went on to win the round forcing Phil to tap out due to Triangle Choke. Karl was taken to A + E after the fight. We wish him a speedy recovery. One of the shortest fights of the evening, David Cieplicki quickly had Simon Hull pinned down to the ground, and delivered a series of blows to the head. Simon was unable to take the punishment and tapped out. John Lee got off to a good start throwing the 1st punches, however Mike Neale quickly turned the tables and had him pinned down. John managed to get the upper hand again and delivered a barrage of punches, however his opponent appeared to lie there and take them, taunting John at the same time. Despite this bravado, after the end of the 1st round, Mike could not continue. 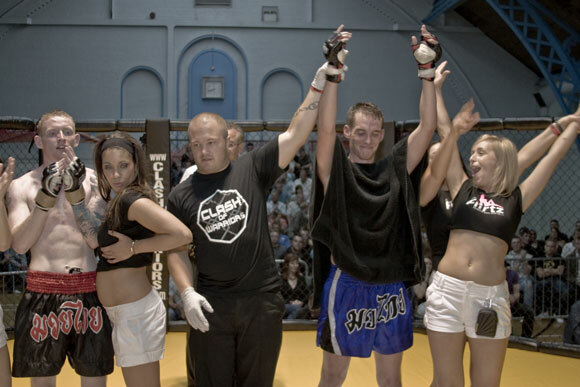 Both fighters were spurned on by a huge amount of support from the audience. Tommy Mullin quickly had Pete Kirkham pinned down to the ground where they stayed for some time. The ref had to advise the fighters to "keep busy" and Tommy certainly did not disappoint. He delivered a huge barrage of punches to the head which Pete simply could not take. The fight was ended due to Referee Stoppage as Pete seemed unable to fight back. One of the most explosive fights of the night without a doubt. 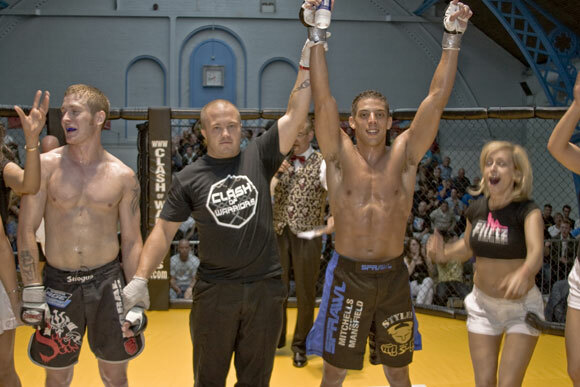 Farid made the first move when he picked up his opponent, carried him across the cage and dropped him on the mat. Farid had him pinned down but it did not take Kane long to get out of it and back on his feet. 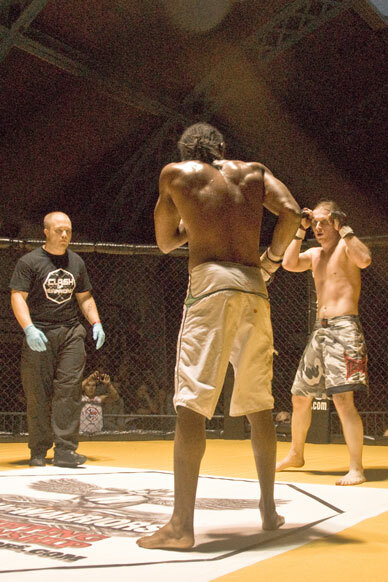 In the first round the ref was forced to have a word with each fighter which did not go down well with the audience. Despite Farid's impressive start it was soon clear that Kane had much more spirit in him. Going into the second round Farid looked like he had an injury to his right eye but despite looking exhausted carried on to the end of the second round. It was such a close fight it was down to the judges, and they unanimously declared Kane the victor. Birmingham fighter Roger Woodward got off to a good start, managing to pin down Marcio almost straight away but it only took the brazilian a second to escape. Roger had him pinned for a second time and made the most of his advantage, delivering a number of knee's to the chest. The fight had to be paused briefly by the ref with Marcio's glove getting caught in Roger's hair. Once back in position, the fight continued, and Marcio was unable to get out of the pinned down position for the rest of the round. Marcio dominated much more in the second round - at one point the ref had to tell him to back off to allow his opponent back to his feet. Although both fighters saw it out until the end of the second round, Roger had incurred an injury to his ankle and could not continue into the third. Another of the evening's shorter fights, Will Jackson was quick to get Carl Byrne pinned down. Once he had him down, Will delivered a barrage of punches to the chest and head which Carl could only withstand for so long. Just after 2 minutes Carl tapped out due to an Arm Bar submission. There was a huge amount of support for local boy Karsten in this one. Karsten wasted no time in getting his opponent where he wanted him. Karsten picked up Rob Ellison, dropped him to the ground and had him pinned down. He then proceeded to deliver a series of punches to the head and chest. 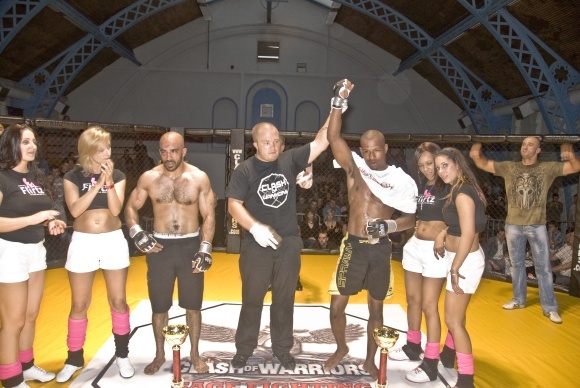 Rob simply could not take the punishment, turned his back to his opponent who then took this opportunity to finish the fight with a rear naked choke. Graham Leck wasted no time getting Paul Hopkins pinned down in the evening's final contest. Most of the round was spent pinned down on the floor with the ref once again reminding the fighters to keep busy. Graham made the most of his early work and delivered head and chest punches whenever he got the chance. Paul managed to hold it for a while but could not quite manage the full round. 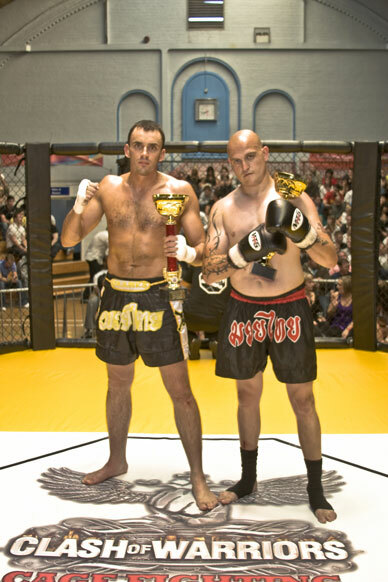 The referee stopped the fight after 4 min's and 10 seconds and Graham Leck was declared the winner.